So, I did notice some response from some people regarding Shining Armor when he appeared a few months back and Crackle now. And I was kind of surprised to look, but not find a topic for MLP. So who watches it, what do you think of it, and do you have any cool links to post for the rest of us? Uh, this hasn't been quite as active as I thought it would. I was waiting to see the reaction to it, and it was pretty minimal. So I'm going to ask what you all thought of the last episode. The general feeling I got from others about it was that it was rather disliked because Spike was out of character the entire time and something about him not being able to bake despite the fact he clearly could in past episodes. If there isn't really any response, I'm just going accept defeat and never touch this topic again and let it fall into wherever it is that untouched topics fall into. Oh, and The J.A.M., I like that picture you have with Pinkie and Rarity. It's just perfect. I am, to be honest, not that big of a brony. I can stand the show (and considering it's target audience is young girls that says a LOT) but never really though it was as amazing as some people do. Anyways, about the most interesting link I can come up with is this tumblr blog. It's by Mr. Gnosis, though I haven't seen him around these forums recently. You'd think a creature with THUMBS would be slightly less....clumsy....and especially someone who has NOT been clumsy while running a library. Well, the story didn't end like mostly every other, so that's a plus. Twilight rents her balloon to Berry Punch. Timber wolves are much more brittle and fragile than they seem. Spike has his own dragon teleportation magic, not necessarily the same used to send messages back and forth from Celestia. The term "noble dragon" is canon! Spike has a prehensile tail. Rainbow Dash is a great voice actor. Why is AJ a terrible actress? What about her role as Smart Cookie? Timber wolves can choke to death. Spike's tongue wasn't split, except on the drawing. And no, the balloon isn't Berry Punch's, it's TWILIGHT'S. Check out the insignia on the side. No Ditzy, but we did see Dinky. And I guess Rainbow Dash forgot that Spike's particular dragon species can climb very well, or she didn't see him climb down the crystal structures at the end of the season premiere. Any horticulturists out there? Can anyone figure out if 24,567,837 blades of grass is a realistic figure for how much grass covers all of Sweet Apple Acres? We might get a rough figure of how large the estate is, too. If there are water skiis, there must be some type of motor boats in Equestria. Upon further analysis, Spike's Instant Messaging is NOT limited to his letters to Celestia. Several fanfics have just been jossed. If AJ is writing a novel, then every fanfic that states she is illiterate or semi-illiterate has just been jossed as well. Claws COULD be a "commodity" in Equestria, if they can be used for scratching backs. "The Dragon is the finest creature ever! There's more to him than just guarding treasure..."
...Wow. When I watched the episode, I was just hoping they'd make a Timberwolves' toy. The timberwolves looked awesome. I hope to see them like that again at some point. Well, I like ponies, I entered the fandom at around early 2011. I watched the first two episodes, and I was hooked since. I still have an interest in the Brony fandom. I went to conventions and halloween parties dressed as Vinyl Scratch. That was cool. Really? It took me a while. I started watching the show of of boredom because I heard that it was good. I watched the new episodes that came out after that, but still wan't a brony. (At least a self-defined one) It wasn't until I had watched all of the episodes again that I could say I was looking forward to season three, and that's when I had "become a brony." It's a cool fandom and I hope to see it continue on for another few years at least. What do you all think? Discord isn't a badguy anymore, and I'm not sure if I like it or not. Equestria's royal summit? I wonder what that is about? Confirmed: Most ponies have hooves the same color as their coats. Twilight can use the Royal Canterlot Voice. Apparently, the one who was most traumatized during Discord's attacks was Spike. Since she's an earth pony, I don't doubt that AJ CAN hear trees gargle. Every fanfic that states that Discord was aware of his surroundings while encased in stone have been canonized! Apparently, the Stare IS a magical action. Did anyone hear Fluttershy growl? And lastly, I wonder what that "reform spell" induces, and how it actually works. Is it a type of magical lobotomy? Would it work on Diamond Tiara? Discord not a bad guy any more? This makes me curious as I'd totally support it, depending on how they did it. From my understanding, they wanted a "Q" like character. Unfortunately, after having watched the opening of Season 2, they missed a major point of Q's character. Everything Discord did was for his own amusement while everything that Q did was directed at achieving a greater goal. Latrans wrote: Everything Discord did was for his own amusement while everything that Q did was directed at achieving a greater goal. Either way, this episode's going to generate a lot of fanart from the DiscordxCelestia shippers. Ellen-Natalie wrote: Either way, this episode's going to generate a lot of fanart from the DiscordxCelestia shippers. Ow! Dang it! Those were my thinking bits! I guess while Ellen got on the subject of fan art, do you guys have any pony OCs? Maybe you have a picture of them you could post? Original Character, no-but one day I tried figuring out how a MLP society would work if it magic was replaced with steampunk, and there were only Earth ponies. So a 'Unicorn' would be an earth pony who was highly knowledgeable in science, and wore a lightening rod on their forehead with an insulating helmet to harness the powers of electricity. A 'Pegasus' would be an earth pony highly knowledgeable in engineering, being able to build all manners of transportation and inventions-especially flying. And an 'Earth Pony' would be...well...still a farmer. But with really cool farming equipment, thanks to Unicorns and Pegesi. And don't worry about being a big brony around here-My husband and I look forward to every episode. That sounds like a totally awesome thing to think about and come up with. 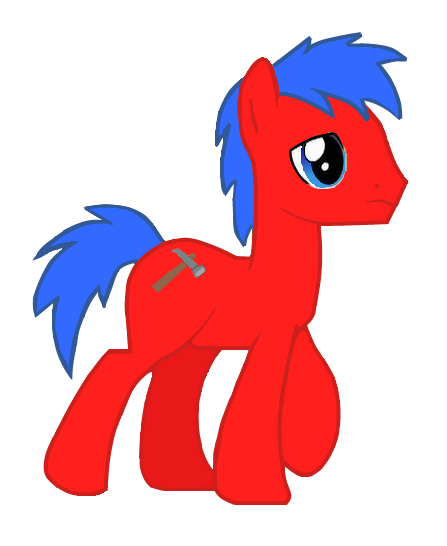 I can't say I have an OC in the fact that I think about it like one, but I do have a pony that I made in Paint.Net. Well, it's another Slice of Life episode, perhaps done to expose a bit more information. This is the third time Spike sings in the series, maybe it's to compensate for 2 seasons of NOT singing? Shining Armor and Cadence do NOT live in the Crystal Empire! They haven't moved there! Cadence is NOT ruling there! Every fanfic that states otherwise has just been jossed! Peewee doesn't like ice cream. Peewee is back with his parents. Spike eats FALLING gemstones by instinct. There are girl scouts in Equestria. Spike turns pink when angry. The railroad from the northernmost Equestrian town to the Crystal Empire has been rebuilt and is now functioning normally. It was way different than I expected it to be, but still good. I was kind of surprised at the value Spike's gems seemed to have. I mean, they don't seem to be rare or anything, but they sure seemed to be able to buy a lot. I liked how the CMC were going to try sky diving. I thought it wouldn't get better than water skiing, but it did. Why did Spike take that measuring cup all over town when he was chasing Angel? Why didn't he remove Tank's propeller? For a moment, Apple Bloom sounded like she said "No way, no hell"
Also, the "Loose Screw" barking mare from "Read it and Weep" appears to have gotten better and is now continuing her therapy at home. Big Mac is best princess. Ever. This is quite a first: an episode that happens simultaneously as another episode. I don't think this has been done before. ERROR! Fluttershy was seen with the WRONG cutie mark!!! Is it just me, or does Twilight's colors seem......darker? RD's dad has a rainbow mane. The Equestria Games are held at least every 5 years. Twilight's levitation power can now handle multiple ponies. AJ's tail is strong enough to lift 3 ponies. Or 2.5, considering Fluttershy is a very light pegasus. Also, verified: "empire" is a misnomer. The place is really just a city-state, or vassal city-state at most, since apparently it's still under Equestrian rule.